Mature couples aren’t people who fall in love so recklessly. And that’s the truth. When you think of someone “falling in love,” you immediately picture a person in some kind of free fall with no control of the situation whatsoever. But that isn’t what mature people do. No. Mature people are always going to want to have some sense of control over the situation that they are in. And that’s why mature people never really “fall in love” in the traditional sense of the term. They step into it. They walk up to it and take ownership of it. And that’s what love is supposed to be. There really isn’t much truth to the saying that you can’t control who you love. It doesn’t always paint the whole story. Yes, you can fall in love with just about anyone. However, you can always control how much you allow yourself to love that person. You can always control the amount of love that you can give to another individual. You can always control who you choose to manifest the love that is within your heart. And it would be pretty immature for you to think otherwise. That’s why a lot of immature couples end up falling out of love. They take their love for granted because they think that love is a freefall that is beyond their control. That’s wrong. And how do you know for sure if you have that immature kind of love? Well, there are a few signs that you can take note of. First, it should be a lot easier than most people typically think. Love isn’t supposed to be so overcomplicated. Love isn’t supposed to be filled with so much drama and turmoil. If you feel like you are forcing a certain narrative way too much, then that it isn’t really love. In real life, love should always write its own narrative – and it’s either you’re happy with it or you aren’t. The reason why there really isn’t any real drama in true love is that drama is for kids who are only chasing a story. But true love is reserved for mature people who chase love in itself – and everything else is just a bonus. Love is always supposed to give you a sense of calm and ease. You should always feel comfortable when you feel the love inside of you. It’s almost like a blanket that protects you from the harsh cold of life. When you love another person and that person loves you as well, there should be no doubts in your hearts about how much you might love one another. You should have the kind of relationship that makes you proud and also humbles you at the same time. It should be the kind of love that gives you peace of mind. Mature relationships are the those that crave for this comfort and stability. The immature ones are always looking for a story and drama. 1. Immature relationships have doubts; mature relationships find answers. Immature relationships are going to be very insecure. They are going to have so many questions and doubts. But mature relationships always work on finding the answers to many questions. 2. Immature relationships focus on wants; mature relationships focus on needs. Immature relationships are always so engrossed in all of the wants. But mature relationships are always going to be more focused on the needs of the relationship more than anything else. 3. Immature relationships erase individuality; mature relationships promote it. Immature relationships are always going to be all about the relationship at the expense of the individual. Bu mature relationships understand that it takes two individuals to make a relationship work. 4. Immature relationships kill ambition; mature relationships encourage it. Immature relationships make people feel like they can’t pursue their goals. But mature relationships always push people towards their goals and dreams. 5. 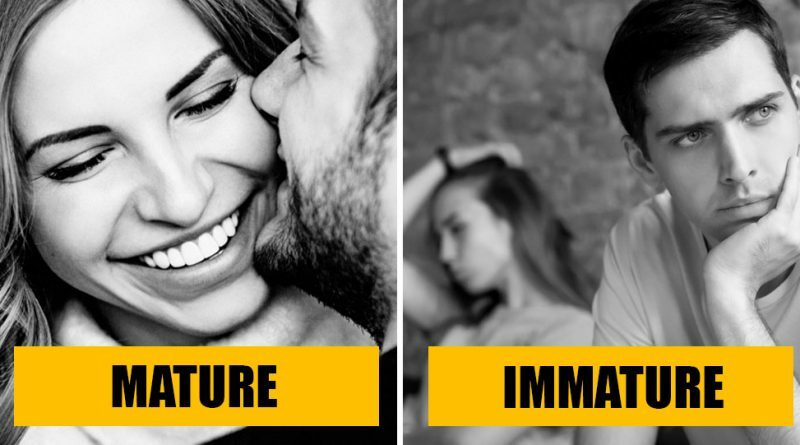 Immature relationships are formed on the cellphone; mature relationships are real-life. Immature relationships have important conversations over cyberspace. But mature relationships always value real-life communication and interaction over any other platform or medium. 6. Immature relationships are about forcing the issue; mature relationships are about adaptability. Immature relationships are always going to have to force things because of how unnatural everything is going to feel. But mature relationships learn to adapt to the needs of the relationship as a whole. 7. Immature relationships always feel threatened; mature relationships espouse confidence. An immature relationship is likely to drown in its many insecurities surrounding it. A mature relationship is always going to be confident in itself. 8. Immature relationships fail; mature relationships are built to last. And at the end of the day, an immature relationship is always going to crash and burn. A mature relationship is going to find a way to carry on and survive. Copyright © 2019 Great Mind. All rights reserved.